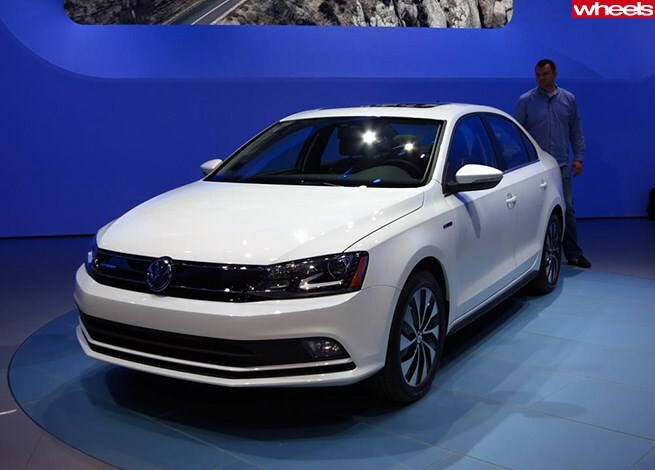 It might look the same, but VW has given its Jetta a tech-driven refresh for 2015. Unveiled today in New York, the face-lifted Jetta cops subtle styling tweaks, including a new front facia, fancier bi-xenon headlights and special spoilers front and back. Another new addition is an active grille shutter on the radiator, which closes at high speed to reduce drag. VW says the changes improve the Jetta’s aerodynamics for greater efficiency, but it’s underneath where VW has really gone to work. The biggest news is the addition of a more efficient 2.0-litre turbo-diesel engine that produces 112kW/333Nm, joining the existing family of three petrol engines. Inside, VW has updated the Jetta’s interior, including the addition of new trim options such as chrome-edged air vents, while safety tech including blind-spot detection, cross-traffic alert and VW’s frontal collision warning system have been added to the options list. Expect the 2015 Jetta to go on sale in the US in the fourth quarter of 2014, with Australian deliveries to follow. Can a turbo four-pot propel a family car to 330km/h+?